I'd heard that pregnancy can conjure up bizarre dreams, but I never experienced it much with with Annalee. Currently, though, I have had some pretty interesting night-time drama. Mostly it's just incredibly strong, negative emotion. Things will happen in the dream and I lose all control in fits of anger, hatred, and frustration. Yelling and throwing things are not uncommon in my uncharacteristic night-self. Last night was no exception. I was playing soccer for my dad's team, apparently as a guest. He put me in for my sister as the last defender. The other team got a few goals and I was put in a different position, replaced by my sister again. We must have ended up losing and at first everything was fine. I guess my dad or somebody said something and it occurred to me that I was being blamed for the loss since they had scored when I was on defense. 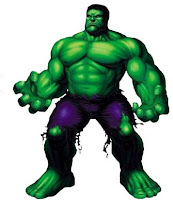 My nighttime Incredible Hulk personality exploded and for the rest of the dream I was in a rampage blowing up at people, yelling, arguing, running, throwing things, etc. Can we say ultrasensitive?? Needless to say, such strong emotion often wakes up with me. Sometimes I can carry on with the morning and my inner Hulk goes back into the shadows. Other times it is not so easy. This morning Lee came to give me a kiss goodbye and told me I could keep sleeping because Annalee was still asleep. Unfortunately, even in my grogginess, my appointment alarm buzzed in my brain reminding me of Annie's early doctor visit. Since I had to get up anyway, I called Lee back in so we could say our morning prayers together. So far so good. My emotions from the night's dream seemed buried with the moon. Too bad it didn't last. I won't go into detail of the exact situation, but let it suffice to say that I made a stupid mistake that I was consciously trying to avoid (something with the computer) and all the sudden, the Incredible Hulk from my dream burst out into the light. When it happens in real life, it's just the strong emotion of frustration. I don't actually start screaming and yelling and hitting things...for the most part. In tears, I got Annalee out of bed and we got ready for the appointment. Surprisingly, Annie ate all her breakfast and fairly quickly so we were actually almost on time. From then on, things got even better. As I look back, everything was amazing. The radio played good uplifting songs that lifted a bit of my load. Annalee was the best she's ever been with the doctor, actually letting him do a complete examination. She continued to be fabulous on our little shopping spree, which is unusual since we made lots of quick stops. Even though I was still unsuccessful at finding a swimming suit for my pregnant self, it was actually enjoyable somehow, probably thanks to Annalee being a doll. Then as I was just finishing up, I got a phone call from my wonderful husband to see if I was out and wanted to meet him for lunch. Not only did I get to spend time with him, but I didn't have to go home and try to figure out what to make for lunch. On my drive home, I almost teared up as I realized the turn of events in my day. It started off with remnants of negative emotion from my dream and turned into a magically good morning. The Lord blessed me in so many small ways and I had to wonder why. That's when it occurred to me that we had said our morning prayers. Funny how doing such a small and simple thing can bring such small and simple blessings that make a big difference. I have to admit that picture got me to read the article right away, otherwise I might have put it off to read after work. Sometimes I don't think that small things (like saying your morning prayers) can really affect a normal turn of events, and that's assuming that God isn't in everything that happens to us. I don't think that's entirely true, Christ is in everything around us, and has complete command over the elements that he can influence the environment we are in, though not people's agency. It's by showing our faith in small things (prayer) that the Lord can make bigger things happen. It's along the same lines as us simply repenting and the colossal affects of His atoning sacrifice being applied to grant us exaltation. I have to say, Sherrie, that there have been several times when I have had to get on my knees during the day and thank the Lord for intervening in my life. I know that we have our agency, and that He will only direct us if we desire it and if we ask. I truly desire His guidance and all the intervening He will do! How sweet life can be with this wonderful gift!